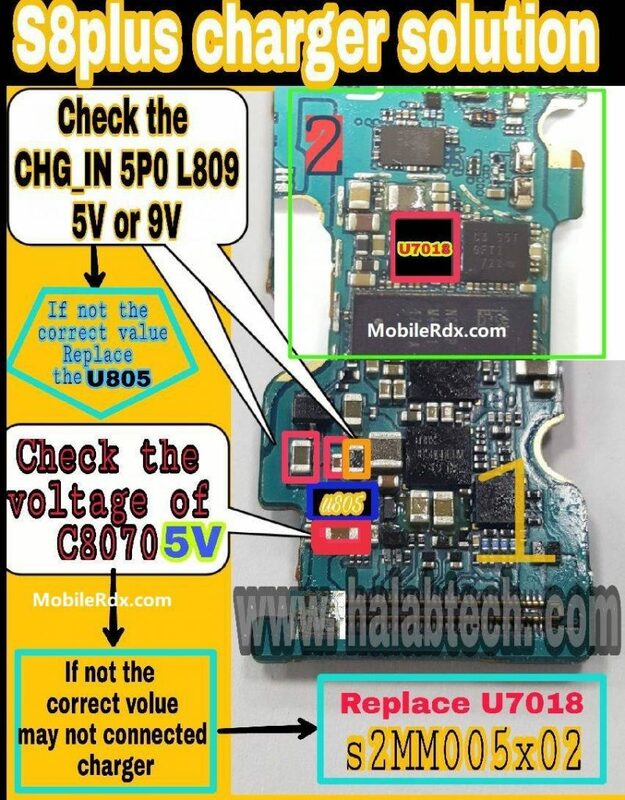 Here is the solution for Samsung Galaxy S8 Plus Not Charging problem like there is No Charging indication shows on the display when the battery charger is being a plug-in. For those that own a Samsung Galaxy S8 Plus, you may be having a problem that the Samsung Galaxy S8 Plus not charging correctly. Samsung Galaxy S8 Plus owners thought that the USB cable was an issue for the Samsung Note 5 not charging. So they went out and purchased a new charger, instead, some quick methods that we’re about to suggest can generally fix the problem when the Samsung Galaxy S8 Plus not charging when plugged in. Check Charging connector for any kind of water damage, if it is then clean it and check. Now re-solder charging connector pins and check. Check charging voltage with the help of a multimeter. Place Negative terminal of the multimeter on ground and Positive on a charging pin (1st pin from your left-hand side). Make sure that the voltage is between 5V to 5.5V, if it is not then replaced charging connector. (Charging Connector can be replaced by heating it from the opposite side of the board, while heating it, pull charging connector with the help of Tweezers). Now remove metal sheet covering the charging section (It contains Charging IC and Components). Check continuity between Fuse and Charging Pin (1st from your left-hand side). If there is no continuity, place jumper. Heat charging IC, if it is faulty then replace it. Now check charge at the battery terminals, if it is not standard voltage then re-solder or replace battery terminals.